I'm in full, old man, get off my lawn mode. And, it's a college football team that set me off. First, some background. You may already know that I'm a fan of the University of Georgia. My daughter went there (and she was a cheerleader) and I almost went there. But I didn't. 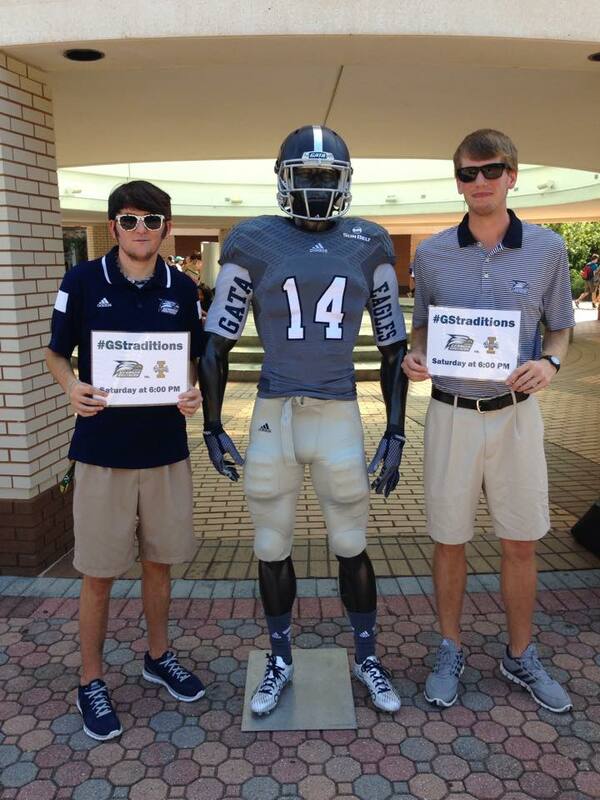 However, a little closer to my home town in southeast Georgia is another college, Georgia Southern University. Back then, it was Georgia Southern College. And, they didn't have a football team. But, that would change. 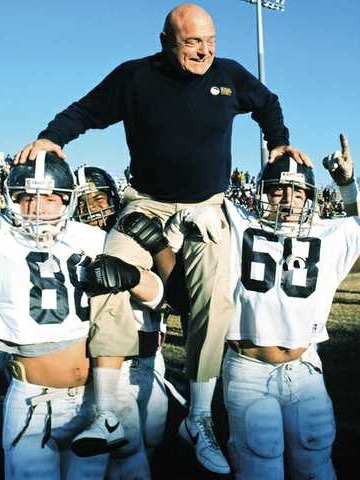 In 1981, Georgia Southern announced the hiring of Erk Russell as head coach. Russell had been defensive coordinator at the University of Georgia for the previous 17 seasons, but accepted the challenge of starting up a football program from scratch. The school had no football facilities when Russell was hired. In fact, they didn't even have a football. The Athletic Director had to run across the street to the K-Mart to buy a football as a prop at the press conference to announce Russell's hiring. Georgia Southern did things simply back then. They got old yellow school buses from the Bulloch County school system to take the team to games. And in those games, the Eagles wore simple white pants with no stripe down the leg, simple blue jerseys at home and plain white jerseys on the road with no stripes on the sleeve, and blue helmets with numbers on the side. Old fashioned, simple football uniforms. And the reason is because they were the cheapest available. Turns out, though, that you don't need fancy buses or fancy uniforms to win. Georgia Southern won the Division 1-AA national championship 1985, their first of three under Russell, and six overall. And they did it while wearing cheap uniforms and riding yellow school buses to games. Today, and for several years, Georgia Southern has been able to afford a lot more. This season is their first year moving up to Division 1-A, officially called Division 1 FBS (Football Bowl Subdivision), and they've kept the traditions. This weekend, though, they're kinda ticking me off. They're showing off some new uniforms to be worn special for homecoming. And they have the nerve to call it "Traditions." I know all the cool schools do this crap. But, it's crap. At least, to a traditionalist like me. I hate it when schools come up with gimmicky uniforms. You know what kind of gimmick I like? Winning. It's a great tradition, too. I'm with you, Basil. DePaul, where I did my undergraduate study, hasn't had a football team since 1934. Stanford, where I did my graduate study, does, though, and I'm a Stanford football fan. Stanford's colors are "cardinal" and white. "Cardinal" is rather a bright red. For the past several years, though, the team has, at times, worn uniforms of a color that I would call maroon (jerseys and pants) or black. The players look like ants in them, and, more important, those aren't the school colors. There can be some difference of opinion as to what color "cardinal" is, but it isn't maroon, and it certainly isn't black. Traditional, classic uniforms continue to look good; the trendier newer ones will be an embarrassment in twenty years. Actually, they're an embarrassment now, but some people don't have the class to be embarrassed. To this day, I still think the NY Jets in their "New York Titans" and the Lions in their throwback uniforms on Turkey Day are the sharpest uniforms I've seen in the pros. Eagles' kelly green beats their Frankfurt Yellowjackets. The Steelers throwback...hurts the eyes. My alma mater went through a change. Indiana Univ of PA. They were called the Indiana...Indians. Brutal. They changes it for PC reasons, but it needed to be changes anyway. Their first swipe looked great. Bear as the logo. Naturally, people assume, "Indiana Bears" (Indiana, PA does have a bear population). Changed it to "Crimson Hawks" Terrible. I gotta give them their proper respect after beating my once mighty Gators last year. Yeah, it was a crap year full of injuries, but still, the Gators should never lose to a team from 1-AA. Incidentally, that was the game where we saw two Gator players blocking EACH OTHER. Embarrassing. As much as I enjoyed watching that game on TV last year, I also enjoyed the first time Georgia Southern and Florida played. 30 August 1986. My first time going to a game at Florida Field. GSC had just come off their first 1-AA championship and were trying to get a 1-A team to play them. Florida was the first team to agree. The Gators beat the Eagles 38-14, but I still had a great time at The Swamp. Y'all made us feel welcome the whole time y'all were whuppin' our butts.